With a diverse range of accommodation available rates in Stockholm. Prevailing custom there, the more strategic and closer to the center of the tourist lodging rates will be more expensive. So, you should choose a hostel close to Centralterminalen or Centralstationen because usually more affordable rates than hotel rates in Gamla Stan area. Below are some cheap hostels that can be selected to stay. The tourists usually stay at City Lodge Stockholm because of its strategic location, just a five minute walk from Centralterminalen or Centralstationen. From station T-Centralen or Drottninggatan is also just five minutes. Here there are rooms with 18 bed mixed dorm so that in one room there are 9 bunk bed. Each punghuni got a small closet to store valuables. Backpack or large kper better kept next to the bed alone. In the back room there is a kitchen, 2 toilets, and 1 bathroom. Although hostels are fully booked, usually you do not need to queue to the bathroom or toilet. Manner that does not line up with waking up early is compared to the other room occupants. So, all the facilities will be available to us. Another is the free internet facilities and free Wi-Fi, if you want breakfast you need to add to the cost. When passing through the city, you will definitely find some signpost hostels, such as Best Hostel Old Town is located very stretegis because it was in the middle of Gamla Stan close to the Royal Palace, Stortorget, and Storkyrkan. But the price to be paid is quite expensive. In addition, this hostel looks very crowded because of all the tourists definitely pass this inn. If 2 Kronor Hostel and Best Hostel Old Town Skeppsborn also located in a strategic position, because it is located at the rear of the main sights of Gamla Stan in Stockholm waters. Three hostels mentioned above seen old so interfering with other existing buildings in Gamla Stan. However, you do not have to worry about the inside of the hostel. Interior rooms look modern. In contrast with the old impression displayed outside so that visitors do not have to be afraid to sleep in the old building. If you have more budget, it does not hurt to stay in one when that is now a hotel. The ship rests on the waterfront and provide rooms for rent. One that can be selected is the ship Af Chapman. 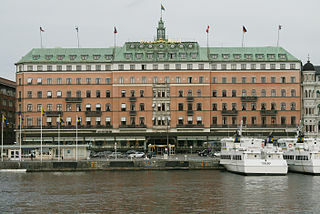 Ships are docked on the island of Skeppsholmen is one of the major sights city landmark Royal Palace and Gamla Stan. Please try to stay in one of the ship’s cabin bunk bed with enough to pay for 260SEK per night. Af Chapman incorporated into the STF or Svenska Turistforeningen, which means that all the guests who are not members of the STF will be charged an additional fee of 50SEK.